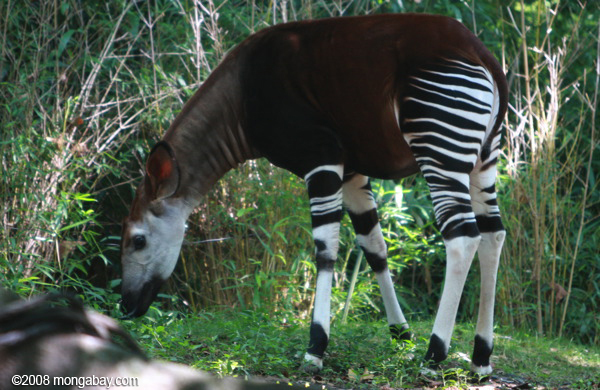 A group that works to protect the rare okapi, a type of forest giraffe found only in the Congo Basin, has has won mongabay.com’s 2012 conservation award. The Okapi Conservation Project [DONATE] has been working to protect the okapi and its habitat in the Democratic Republic of Congo (DRC) for 25 years. The group was instrumental in establishing the Okapi Wildlife Reserve, a 13,700-square-kilometer tract of wilderness in the Ituri Forest of northeastern DRC. While the Okapi Conservation Project has had a long track record of success, earlier this year it was devastated by a brutal attack on the reserve’s headquarters. Two wildlife rangers were among the six people killed during June 24 assault. 14 endangered okapi were slaughtered during the early morning raid, which was reportedly a response to a crackdown on illegal elephant poaching and gold mining inside the Okapi Wildlife Reserve. The attack was led by Mai Mai Simba rebels. The militia destroyed buildings and equipment at the facility, which is shared by the Institute in the Congo for Conservation of Nature (ICCN) and the Okapi Conservation Project. Computers, phones, medical supplies, food, and other gear were stolen. The dead included two ICCN rangers, the wife of one of the rangers, an immigration worker, and 2 residents of Epulu, the town where the attack took place. In recognition of the shocking attack and the general struggles of working in the DRC, Mongabay.com selected the Okapi Conservation Project as this year’s recipient of the award. Each year mongabay.com selects an organization to honor with its conservation award. 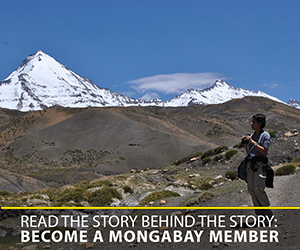 The award includes a cash prize and prominent placement of mongabay.com’s homepage and in its weekly newsletter for the month of December. Previous winners include the Amphibian Ark (2011), AITo and the Nantu Forest Conservation Program (2010), WildlifeDirect (2009), Health In Harmony/Project ASRI (2008), and the Amazon Conservation Team (2007). (07/05/2012) Officials have pointed to an infamous elephant poacher known as ‘Morgan’ as the head of the murderous attack at the Okapi Wildlife Reserve station in the Democratic Republic of the Congo (DRC) late last month. The attack by Morgan and his crew left seven people dead, including two wildlife rangers. The poachers also shot dead 13 captive okapis at the headquarters, which were considered ambassadors for the imperiled forest. One okapi remains alive, but injured and conservationists are not optimistic about its survival. UNESCO and the the NGO Fauna and Flora international have issued an emergency appeal to raise $120,000 dollars within two weeks for the victim’s families as well as for rapidly rebuilding the station. (06/29/2012) Two wildlife rangers were among the six people killed during brazen attack on a wildlife facility by a militia in the Democratic Republic of Congo last Sunday. 13 endangered okapi were slaughtered during the early morning raid, which was reportedly a response to a crackdown on illegal elephant poaching and gold mining inside the Okapi Wildlife Reserve. (09/02/2009) The giraffe is one of Africa’s most recognizable animals, but its shy and elusive forest cousin, the okapi, was so little known that until just over a century ago the western world believed it was a mythical beast, an African unicorn. Today, a shroud of mystery still envelops the okapi, an animal that looks like a cross between a zebra, a donkey, and a giraffe. But what is known is cause for concern. Its habitat, long protected by its remoteness, was the site of horrific civil strife, with disease, famine, and conflict claiming untold numbers of Congolese over the past decade. Now, as a semblance of peace has settled over Democratic Republic of Congo (DRC), the okapi’s prospects have further dimmed, for its home is increasingly seen as a rich source of timber, minerals, and meat to help the war-torn country rebuild. In an effort to ensure that the okapi does not become a victim of economic recovery, the Okapi Conservation Project (OCP) is working to protect the okapi and its habitat. Founded by John Lukas in 1987, well before the conflict, OCP today manages the Okapi Wildlife Reserve, a 13,700-square-kilometer tract of wilderness in the Ituri Forest of northeastern DRC. (12/05/2011) An effort to save the world’s most endangered amphibians has won mongabay.com’s 2011 conservation award. Amphibian Ark — a joint effort of the World Association of Zoos and Aquariums, the IUCN/SSC Conservation Breeding Specialist Group, and the IUCN/SSC Amphibian Specialist Group — is working to evaluate the status of threatened amphibians, raise awareness about the global amphibian extinction crisis, and set up captive breeding programs. The initiative is targeting 500 species that will not survive without captive breeding efforts. (12/08/2010) Two groups working with local communities to conserve forests in Sulawesi have won mongabay.com’s 2010 Conservation Award. The Alliance for Tompotika Conservation (AlTo), which works in Central Sulawesi, and the Nantu Forest Conservation Program, which operates in North Sulawesi, were recognized for their efforts to protect endangered forests on the Indonesian island, which is known for its high levels of endemic species. (12/01/2009) Wildlife Direct, a group that promotes conservation through blogging by rangers and scientists, has won mongabay.com’s “Innovation in Conservation Award” for 2009. The prize, which includes a cash donation and and prominent placement on the mongabay.com web site and newsletter for the month of December, is granted each year to an organization using an unconventional and highly effective approach to conserving forests and biodiversity. (12/08/2008) Health in Harmony was today awarded mongabay.com's annual "Innovation in Conservation" award for its unique approach to conservation which combats illegal logging by providing healthcare and sustainable livelihoods to communities living around Gunung Palung National Park in Kalimantan, on the island of Borneo. The award includes a cash grant and prominent placement on the mongabay.com web site and newsletter for the month of December. Health in Harmony is working to break an impoverishing cycle of illegal logging and deforestation by offering healthcare rewards to encourage the villagers to protect the national park, rather than log it. The effort seems to be paying off: since launching a 'forests-for-healthcare' incentive program in September, 18 of 21 communities have signed a moratorium of understanding agreeing to participate. (12/11/2007) The Amazon conservation Team (ACT) was today awarded mongabay.com’s inaugural “Innovation in conservation Award” for its path-breaking efforts to enable indigenous Amazonians to maintain ties to their history and cultural traditions while protecting their rainforest home from illegal loggers and miners.